OMG! 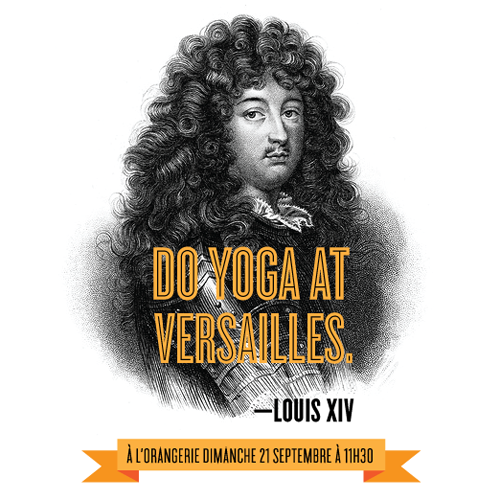 In September you will have the chance to do yoga at L’Orangerie at the Château de Versailles. The event, Yogis du Coeur, is organized by Mécénat Chirurgie Cardiaque Enfants du Monde, an organization dedicated to providing heart surgeries to children whose families either lack the means to afford them, or who live in countries where these often life-saving techniques are not available. How apt and wonderful to do yoga -- a practice that connects you more deeply to your own heart -- in order to help another beating heart. Aux tapis, citoyens ! To your mats, citizens! Unfurl a yoga mat (generously donated by Nature et Découvertes, one of the event’s sponsors), and experience one of Versailles’ most beautiful spaces. L’Orangerie is tucked underneath the château’s cent-marches, and is made up of one central vaulted gallery, as well as two smaller ones on the sides. This will be the perfect vantage point from which to take in the citrus, palm, oleander and pomegranate trees (some of which are more than 200 years old,) the round pool and the soothing harmony of André Le Nôtre’s garden design. After class, enjoy tea and light snacks (available for purchase from sponsors,) buy a commemorative t-shirt designed by YUJ (available for 20€,) and roam the grounds unimpeded for 45 minutes. • Sign up online here as soon as possible as space is limited! 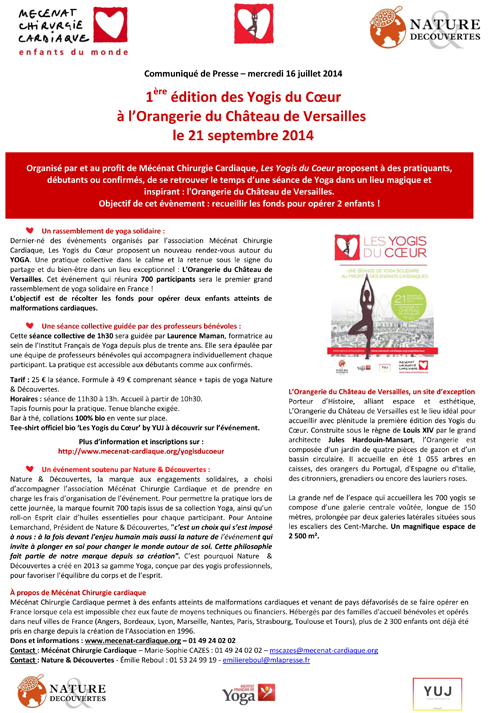 It is 25€ per person, or 49€ for the package which includes a Nature et Découvertes yoga mat. Consider making a king-size contribution! Every time you use your mat, you’ll be reminded of the heart you helped to mend. As the event takes place during Journée des Patrimoines, access to the château will be highly restricted. Please enter on the south side of the château (route de St Cyr,) and plan to arrive no later than 11h15. This all levels class will be taught by Laurence Maman, who has been a student of T.K.V. Desikachar’s since 1977, and has been teaching and training teachers for more than 30 years. Laurence will be assisted by a team of volunteer teachers from l’Institut Français de Yoga.